I've been a long time reader of Beth Revis' blog (author of the upcoming ACROSS THE UNIVERSE), so I was very excited when she banded together with a group of debut YA authors who write science fiction and dystopian works to form the The League of Extraordinary Writers. The five writers have works that run the gamut of near-future mind control to far-future space travel, but they do have one thing in common: a future where the Earth we know now is twisted, gone. In addition to Beth, the League is made up of Elana Johnson (author of CONTROL ISSUES), Julia Karr (author of XVI), Angie Smibert (author of MEMENTO NORA) and Jeff Hirsch (author of THE LONG WALK HOME). All of these books are coming out in Spring or Summer of 2011. [Find out more about the publication information] Their goal was simple: post something new about dystopian lit nearly every day, and get more people exploring the genre. The league writers were kind enough to send me some links to their favorite blog posts as well as summaries for each book and some exclusive tidbits about each as well. So read on, and get excited for The League of Extraordinary Writers! We have a variety of blog posts and styles, with something new every week. Julia recently compiled a post of some of the greatest reveals in dystopian literature. Jeff wrote a playlist for the apocalypse, featuring all the songs that talk about the end of the world, and Angie recently came up with a list of theoretically and scientifically support ways the world could end. We also post about writing dystopian. Beth talked about the mechanics of writing about setting in a dystopian work of literature, a post later featured by io9. Elana blogged about Scott Westerfeld's quote "I think therefore I read and write (dystopian)" and how he says that even if something is horrific and seems like we can’t overcome it, we must try, lest we “wither away inside the fence.” We also recently did our first Book of the Month club selection on AMONG THE HIDDEN by Margaret Pierce Haddix, and each posted about a different aspect of the book we liked. This month's selection will feature Suzanne Collins and giveaways of MOCKINGJAY! As for our debut books, we've collected some information on them that we hope will make you as eager for 2011 as we are! So, what are all the books about? • MEMENTO NORA: In the not-so-distant future, Nora, the popular girl and happy consumer, witnesses a horrific bombing on a shopping trip with her mother. In Nora’s world, terrorism is so commonplace that she can pop one little white pill to forget and go on like nothing ever happened. However, when Nora makes her first trip to a Therapeutic Forgetting Clinic, she learns what her mother, a frequent forgetter, has been frequently forgetting. Nora secretly spits out the pill and holds on to her memories. The memory of the bombing as well as her mother’s secret and her budding awareness of the world outside her little clique make it increasingly difficult for Nora to cope. She turns to two new friends, each with their own reasons to remember, and together they share their experiences with their classmates through an underground comic. They soon learn, though, they can’t get away with remembering what the powers-that-be want them to forget. • THE LONG WALK HOME: Jeff Hirsch's debut novel, The Long Walk Home, follows fifteen-year-old scavenger Stephen Quinn and his father twenty years after The Collapse, when America was wiped away by a nearly apocalyptic war with China. When their decision to risk it all to save the lives of two strangers leaves his Dad dreadfully injured, Stephen must lead them to safety in a lost remnant of the Pre-Collapse world. There, Stephen falls in with Jenny Tan, the wild child town outcast, bringing him into violent conflict with a group that is determined to remake the world that was, no matter the cost. • CONTROL ISSUES is set in a world where Thinkers control the population and Rules aren't meant to be broken, but fifteen-year-old Violet Schoenfeld does a hell of a job shattering them to pieces. When secrets about her "dead" sister and not-so-missing father hit the fan, Vi must make a choice: control or be controlled. • ACROSS THE UNIVERSE: Seventeen-year-old Amy joins her parents as frozen cargo aboard the vast spaceship Godspeed and expects to awaken on a new planet, three hundred years in the future. Then she wakes up fifty years early. Amy quickly realizes that her awakening was no mere computer malfunction. Someone—one of the few thousand inhabitants of the spaceship—tried to kill her. Now, Amy must race to unlock Godspeed’s hidden secrets. But out of her list of murder suspects, there’s only one who matters: Elder, the future leader of the ship and the love she could never have seen coming. • XVI: Every girl gets one. An XVI tattoo on the wrist - sixteen. They say they're there for protection. Some girls can't wait to be sixteen, to be legal. Nina is not one of them. Even though she has no choice in the matter, she knows that so long as her life continues as normal, everything will be okay. Then, with one brutal strike, Nina's normal is shattered; and she discovers that nothing that she believed about her life is true. But there's one boy who can help - and he just may hold the key to her past. But with the line between attraction and danger as thin as a whisper, one thing is for sure... for Nina, turning sixteen promises to be anything but sweet. • MEMENTO NORA: It began as short story Angie wrote for Odyssey magazine (May / June 2008). The theme for that issue was memory. Angie has always been fascinated with the topic. (She forgets why.) When she researched the story idea, Angie ran across several articles about using certain drugs to lessen the effects of Post Traumatic Stress Disorder. Researchers found a pill that might help unstick painful memories. So, she thought what if that pill was available to everyone—and it really worked. Angie had a vision of a corner shop / strip mall type chain that dispensed the pill—and gave you frequent forgetting points each time. Kind of like a frozen yogurt place or Starbucks. • THE LONG WALK HOME: The whole thing started when, for who knows what reason, the image of a kid helping his Dad bury someone on a hill overlooking the ruins of an old mall popped into Jeff's head. He had that and the idea that it would have a post-apocalyptic setting and was off and running. • ACROSS THE UNIVERSE: The title of the book is, actually, named after the Beatles song, and Beth listened to it obsessively while writing. It took her about a year to write the entire manuscript, but she always had the twist at the end planned--she wrote the book mostly in order to write the ending. • XVI: The idea for XVI all began as a mental picture that flashed through Julia's brain of a punk rock girl walking down a city street, earbuds in her ears, blocking out the noise. Then NaNoWriMo started and they always suggest starting with a character and a location ("no plot - no problem") so, she took that girl and plopped her in the Chicago of the future and 30 days later, she had the first draft of XVI. • THE LONG WALK HOME: Well it wasn't fun at the time, but a significant moment in the evolution of the book was a decision Jeff made between the 2nd and 3rd draft to completely delete the last 150 pages of the book (it was only a little over 300 pages total at the time) and start over. It was a huge leap of faith and a tough thing to do but it wasn't until then the book really took off. All hail the power of the delete key! • CONTROL ISSUES: You know how girls always want the bad boy? Well, in CONTROL ISSUES, there are two groups of people that have been separated: good (the brainwashed) and bad (the uncontrolled). And, you guessed it, everyone will get to decide for themselves if Jag Barque, the bad boy, is really bad at all. • ACROSS THE UNIVERSE: There are two main point of view characters in the novel--Amy, who's from a near-future Earth, and Elder, who was born on the spaceship. They're not really based on anyone Beth knows--but the side character, Harley, is. When she was writing a friend for Elder, she happened to be in the classroom where she taught, and one of her students, a talented artist named Charly (short for Charlotte) had painted her a koi fish as a gift. Beth switched the name to Harley and gave him to Elder as a best friend--her beta readers liked the character so much that he became a huge part of the story. • XVI: Well, Julia's future Chicago still has some things from the present - like streets and parks and the Chicago River. Julia pored over a city map with a magnifying glass picking out locations where she had been many years ago when she lived in Chicago. And, using those locations, Julia added the necessary places - schools, a coffeehouse, a restaurant, houses, hotels and apartments to build a city that she not only knew but had now imagined. It was fun, and when she visits Chicago now, she gets glimpses of her characters peeking around corners, disappearing into buildings and running through Lincoln Park. Are you all as excited as I am?! Wowzer. This is awesome. I love the descriptions of all of these books. Dystopian lit is by far my favorite genre, so this post has me all in a tither. And, love that Scott Westerfield quotation! Wow, I can't believe we're talking about books for 2011 already! I love the idea of The League of Extraordinary Writers! Ooh super post and I am taking notes on a few of these titles. I have not dipped more than a toe into the dystopian novel genre but hope to go a bit deeper. Thanks for the information. These all sound like amazing stories. I'm very excited!! Wow, what a great list--cool that these writers joined together. Looking forward to some great 2011 dystopian reads! Oh wow! This is such a great post and really has a lot of neat information in it. I also loved that you posted the plot summaries of the upcoming books. This is awesome and I am going to be checking some of these out! I bookmarked this one so that my son can check out these books and see what grabs him! These sound so good! I've been searching for some dystopians besides the Hunger Games, but very similar to them, and I've been coming up almost blank. So hooray! Terrific post! I'm going to be watching for these titles next year. Thanks! Wow, many of these sounds really interesting, and I hadn't heard about most of them! Thanks for helping us discover new books. I'm bookmarking this for future reference! 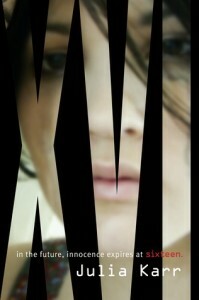 XVI sounds like a book I should be watching out for! Ooh, these sound great! I've been looking forward to XVI for awhile (and what a gorgeous cover!) but now I'm really excited for MEMENTO NORA too. Ack! I meant to comment earlier and have just been behind on all my blog reading! Anyway, I wanted to say THANK YOU Lenore for featuring our titles and blog!! I reallllly can't wait until 2011! Thanks for posting about us Lenore! Hi everybody, glad to hear you're all excited for a few more tastes of the end of the world. We can't wait to get our books out to you!